From the moment he made his NHL debut against the Winnipeg Jets on October 14, 1981, to the Edmonton Oilers elimination in the first round of the 1989 playoffs at the hands of Wayne Gretzky and the Los Angeles Kings, no goaltender had accomplished more during said period of time than Grant Fuhr. In fact, only a handful of players in the history of the game had put together the kind run the former Victoria Cougars standout did to start his career. The Spruce Grove native not only backstopped the Oilers to four Stanley Cup Championships in five years but was widely recognized as being the best netminder in the business for some time, despite having just one Vezina Trophy to his credit. His presence in goal during multiple international events spoke volumes, as did his innate ability to raise his level of play whenever his team needed it most…especially come playoff time. Five Stanley Cups and an always-cool demeanor. Despite falling to No. 99 and the Kings during the opening round of the aforementioned 1989 post-season, Fuhr still had plenty of hockey left in him. Making what occurred during the summer of 1989, all the more baffling. Out of nowhere, the all-star goalie threatened to walk away from the game at 26-years of age, thanks to an apparent dispute with Glen Sather and some bad advice from agent Ritch Winter. After completing a round of golf on the afternoon of June 8, 1989, Fuhr stunned local media with news of his decision to call it quits. To make matters worse, he made the announcement while still standing next to his golf cart and with Winter by his side. While no specifics were given as to what the “issues” were, he added this little nugget, to help fuel the fire. Oddly enough, this was the first anyone had heard about the so-called “building up” between Fuhr and the organization. With that said, the Winter vs Sather battles were well-known in this neck of the woods and included a confrontation in which the two engaged in a shoving match while trying to hammer out a new deal for the netminder back in 1987. Publicly the dispute was over Fuhr not getting the respect he deserved but in reality, it was about money and the Oilers underpaying their star players…a regular occurrence during the Peter Pocklington era. At that time it was rare for a player to stand his ground in hopes of landing a big contract, as teams seemingly always held the hammer and used it to their advantage. With player salaries being what they were, Winter did what any good agent should do and looked at other potential money-making endeavours for both himself and his client. To his credit, he was able to secure Fuhr a five-year contract with the Pepsi-Cola, that would’ve seen the future Hall of Famer have a Pepsi logo on each of his pads, starting in the upcoming 1989-90 season. A clever idea to be sure and one that was well ahead of its time, but there was one major hurdle standing in the way. The NHL prohibited players from selling advertising space on their equipment and still do to this day. However, in Winter’s opinion, the Oilers could have signed a “special waiver” allowing his client to wear the logo on his equipment. Unfortunately, it wasn’t quite that simple…even if the club had agreed to do so. Again, with the league already having a policy in place, it seemed fairly straightforward but Winter was telling his client it was the Oilers who were holding things up. In his mind, if the club was unwilling or unable to pay Fuhr what he was worth, the least they could do was help him out with the Pepsi deal. That was never going to happen and with the two sides at a standstill, no one knew what would come next. Fuhr had actually signed and given the club his retirement papers in early June but his general manager never did file them with the league. However, it was clear Sather was starting to lose his patience with Winter, who was actively trying to force a trade to the Detroit Red Wings, who would have happily given his client a significant bump on his annual salary of roughly $400,000. Not surprisingly, Sather wasn’t thrilled and immediately cut off communication and put the ball back in Fuhr’s court with training camp approaching. With his season and possible career hanging in the balance, and no real interest in retirement, the veteran goaltender agreed to meet with his general manager in a one-on-one setting in hopes of working something out. After coming to the realization it was the NHL and not the Oilers who was prohibiting him from putting the deal with Pepsi into action, his stance softened. 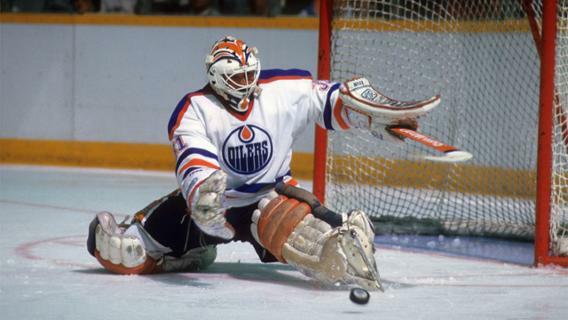 On August 24th, 1989, it was made official that Fuhr would be remaining with the Orange and Blue. Though his agent did him no favours with the approach he took, the fact this situation turned into the fiasco it did was on the player. It was a poor decision and one that triggered a sequence of events which would see the playoff hero go through as tough an 18-month stretch, both on and off the ice, as any player in recent memory. As if the contract dispute wasn’t distraction enough, things would go from bad to worse thanks to a medical emergency and a rash of injuries that would make the 1989-90 campaign a wasted year in what had been a brilliant career. Just three weeks after the club announced he would be staying in the Alberta capital, Fuhr would find himself back on the sidelines courtesy of an emergency appendectomy. After complaining to the training staff about an abdomen discomfort and quick examination from defenceman Randy Gregg, the five-time all-star was immediately sent to see a specialist and the news wasn’t good. Upon further examination, it was determined his appendix could have ruptured at any moment and that surgery would be required. The operation was a success but initial speculation had Fuhr needing eight-weeks to recover. A tough break for both the club and player but one made even harder to overcome following Jimmy Carson’s decision to walk away from the club and demand a trade all of four games into the season. Fuhr would return to the lineup after just five and a half weeks, taking on the Montreal Canadiens in late October and proceeded to start 15 of Edmonton’s next 22-games, posting a 7-5-3 record. Not surprisingly, he struggled with his consistency after such lengthy layoff but did manage to pull the Oilers out of last place in the Smythe Division and into the division lead by mid-December following a tilt with the St. Louis Blues. After playing the Blues to a draw, it was revealed Fuhr hurt his shoulder during the game and would be sidelined for up to 12 weeks, something which plagued him throughout his time in Edmonton. He returned in early March and looked sharp in beating the Philadelphia Flyers and followed that with another impressive performance against the Pittsburgh Penguins. With back-to-back wins under his belt, the star netminder seemed poised to go on a run. That all changed in his next start, as Fuhr allowed six goals before being yanked in a 7-5 loss to the Winnipeg Jets in which the Oilers blew a four-goal lead. To make matter worse, the veteran netminder fell on his left shoulder during warmup four nights later in Quebec and just like that, he was back on the shelf. The initial diagnosis seemed to suggest it was nothing more than scar tissue causing Fuhr discomfort but that smoke screen was soon put to rest. With the playoffs just around the corner and the club not at all sold on Bill Ranford being able to carry the mail, Fuhr gave it one more shot against the Calgary Flames in the Oilers second last game of the season. Unfortunately, he would play just one period, giving up four goals in just under four minutes and was visibly favouring his shoulder throughout the opening 20-minutes. From the club’s standpoint, it was a last-ditch effort to try to get one of the league’s premier goalies ready for the post-season but it simply wasn’t meant to be. With their playoff stalwart officially out of the picture, there was nothing but questions surrounding Edmonton heading into the playoffs and those concerns only grew louder after falling behind 3-1 to the Jets in their opening round series. Lucky for them, Ranford found his game overnight after struggling mightily in the first four games and it changed the entire series and playoffs. From that point on, the Oilers jumped on the back of their young netminder and Mark Messier, who continued to deliver one MVP performance after another en route to winning their fifth championship in seven years. Though it could not have been easy for Fuhr to watch from the press box, as a teammate, he could not have been happier with the outcome. The club not only managed to rally around his replacement but reached their ultimate goal. On a personal level, it was the toughest season of his career but watching “the guys” hoist the Cup made it far easier to stomach and the thought of what next season would bring all the more enticing. After all, how could things possibly go any worse during the 1990-91 season? Regrettably, they did and the future Hall of Famer was about to become the talk of the sports world and for all the wrong reasons. On the morning of August 31st, 1990, the Edmonton Journal ran a story which the organization and their fans wanted no part of but there it was for all to see. The piece was put together by a trio of writers, Tom Barrett, the legendary Cam Cole and David Staples, and focused on the longtime substance abuse of one of the team’s most notable players. The individual in question turned out to be none other than Grant Fuhr. So yes…things could definitely get much worse. After struggling through what was a disastrous 1989-90 campaign, at least on a personal level, the eighth overall pick in the 1981 NHL Entry Draft was about to see his career hit a new low. Prior to making the news of his struggles public, the Journal gave him the opportunity to come clean and readily admit to abusing a controlled substance over last several years. With his “secret” on the verge of coming out and his ex-wife playing a key role in helping break the news, Fuhr decided to do exactly that. He first started using cocaine back in 1983, typically going on “binges” once every three or four weeks and continued doing so until checking himself into the Straight Center in the summer of 1989 following a positive result in a test for his now ex-agent. Grant Fuhr admitted to repeatedly denying he had a problem over the last number of years, despite being confronted on the matter by Sather on numerous occasions. Obviously, the organization and those close to the veteran netminder knew there was something up but with no one willing to corroborate their suspicions, their hands were tied until someone did. The moment Corrine Fuhr decided to put the future well-being of her ex-husband ahead of the potential damage it could do to his reputation, was the moment everything changed. Though it would certainly cost him more time away from the game, getting Fuhr the help he needed was priority one and something that was long overdue. After all, whatever was to follow could be dealt with and would pale in comparison. Though both the player and organization were hopeful the league would show leniency when it came time to hand out punishment, the expectation was for some sort of suspension to be part of the deal. Nearly four weeks after the Journal ran the story and the day before his 28th birthday, Fuhr was handed a one-year suspension from the league…so much for leniency. Fuhr was devastated by the ruling, especially since he had been tested three times over the last calendar year and all three came back negative. As bad as the news was, Ziegler did leave the door open for the potential of early reinstatement, should Fuhr meet certain conduct requirements. Though the organization had the option of appealing the decision, they decided against it and focused instead on getting their star netminder’s life back on track. The punishment may have been harsh and perhaps even unfair but at the end of the day, it’s on the individual. To his credit, Fuhr took full responsibility for his actions and was focused on gaining early reinstatement. On February 4, 1991, Ziegler held true to his word and allowed Fuhr to once again pull on an Oilers jersey as an active player and resume his career. It certainly wasn’t easy but nothing about the situation suggested it ever would be. After missing the club’s first 59-games of the season, he was about to once again be given the keys to the car in Game No. 60 against the New Jersey Devils on February 18th. In the two weeks leading up to his return, Fuhr would make four appearances for the Cape Breton Oilers. His play was uneven at best in the AHL but all that really mattered was how he played in his return to the NHL. Everything else was nothing more than noise. With the game nationally televised on TSN, the buzz throughout the hockey world was about Fuhr’s return and no one knew what to expect. It had been almost two full seasons since anyone had seen a healthy No. 31 in between the pipes for the Oilers and with such a long layoff since his last start, there was nothing but uncertainty surrounding his latest comeback attempt. After years of wearing some of the most recognizable gear in the game, Fuhr took the crease minus his usual colourful equipment and instead decided to go with all white attire against the Devils. This was supposed to be a fresh start and with Ranford in the midst of a solid campaign, the club gave no real indication if his return to the Oilers was going to be short-lived. Edmonton arrived in New Jersey having dropped six of seven and were in desperate need of a spark, which is exactly what their veteran netminder provided. Fuhr was simply outstanding in his debut, turning aside one opportunity after another and playing his usual electrifying style. Oddly enough, he looked even more relaxed than usual, which is hard to imagine for those who were fortunate enough to watch him play over the first eight years of his career. His presence rejuvenated what had been a rather lacklustre bunch, as players were diving in front of shots whenever the opportunity presented itself, on top of putting a handful of pucks behind Chris Terreri down at the other end of the rink. At the final buzzer, the Oilers had earned two crucial points on the road and Fuhr returned in style, blanking New Jersey 4-0 and instantly quieting critics who thought his best days were behind him. Over the next six weeks, the veteran guardian continued to impress with each and every outing. Having never been one to report to camp in the best of shape, the fact Fuhr returned to the game in arguably the best physical condition of his career was working in his favour. To be honest, No. 31 wasn’t in mid-season form but rather playoff form and it was next to impossible to ignore. By season’s end, Grant Fuhr had posted a 6-4-3 record, starting 13 of Edmonton’s final 21 games and took over as the club’s No. 1 goalie heading into the playoffs. Some were miffed at John Muckler’s decision to go with the vet over Ranford but to his credit, the head coach went with the guy who he felt gave his team the best shot to win and it was a decision that paid immediate dividends. After almost single-handedly stealing the opening game of their first-round series with the Calgary Flames, those questioning Muckler’s decision were quickly silenced. In what turned out to be one of the finest playoff series ever played, Edmonton outlasted the Flames in a seven-game classic. It was hockey at its finest and Fuhr’s performance was arguably the best of his career. Hard to imagine with his resume being what was but he was that good. Though the Oilers seemed poised to take a serious run at defending their crown after bouncing the Flames, it was not meant to be. The punishing style they were forced to play against both Calgary and the Los Angeles Kings took its toll and eventually caught up to them in the Western Conference Final against the Minnesota North Stars. The want was certainly there but the tank was empty. It was one hell of a ride but fell just short of the team’s ultimate goal. From an individual standpoint, the final few months of the 1990-91 season and playoff could not have gone much better for Grant Fuhr. His return was remarkable to watch unfold and unlike any other in league history. It was quite the journey and one that ultimately saved what turned out to be a Hall of Fame career. But more importantly, it allowed one of the greatest goaltenders in NHL history to get his life away from the rink back in order.